Hana al-Shalabi is a 30-year-old Palestinian woman and resident of Burqin village near Jenin who was taken from her home and arrested on February 16. On February 23, she was given an administrative detention order for six months. She has been on a hunger strike for 41 days in protest of her violent arrest, the harmful and degrading ill-treatment she suffered following her arrest and of her administrative detention. Just two days ago, an Israeli military judge rejected an appeal against Hana's administrative detention without charge or trial claiming that there are grounds to continue holding her as she is a threat to Israel’s security. But as Amnesty International makes clear, Israel must either charge Hana with a recognizable criminal offence and promptly try her or release her. Hana, just like Khader Adnan, needs international solidarity and support for her case to amplify her voice and that of nearly 5,000 fellow Palestinian prisoners, including approximately 310 held in administrative detention without charge. Send a letter now to Israeli officials demanding her freedom. 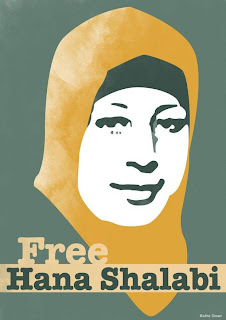 Call the office of Jeffrey Feltman, Assistant Secretary of State for Near East Affairs, and demand the United States intervene to force Israel to release Hana Shalabi and all political prisoners. The number is 202-647-7209. Find talking points here. Watch the video below to learn more about Hana's case. And make sure to share with your friends and followers. Vote for Anna in People’s Choice Award!